Larry E. Matthews, author, historian, and professional geologist. Have you ever wondered what is going on under your feet? 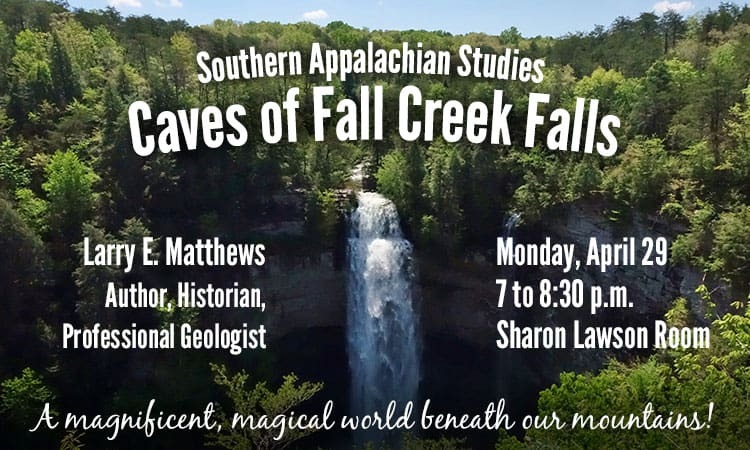 Matthews will delight and enlighten us on the magnificent, magical world underneath our mountains. The greater Fall Creek Falls area has the largest number of caves of any public land in Tennessee. The many large, interesting caves, combined with the stunning wilderness area makes this a Caver’s Paradise. The roughly 15 miles wide by 16 miles long area covered in this book contains 1,184 known caves, 12 of which are over a mile long. Modern cave explorers have been unraveling the secrets of these caves since the early 1950s. Exploration, mapping, and dye tracing show two huge underground drainage systems: one in the valley of the Caney Fork River and the other in the valley of Cane Creek. This book describes those caves and their hydrological connections.